Millions of asthma sufferers can breathe a bit easier thanks to research and products coming out of Israel. ISRAEL21c brings the top 10 advances in the field. May 1 marks the annual World Asthma Day. In keeping with this year’s theme, “You Can Control Your Asthma,” ISRAEL21c presents the top 10 Israeli innovations making that goal more attainable for the approximately 250 million to 300 million people suffering from the inflammatory lung condition. Asthma is the world’s most common chronic disease among children. In the United States alone, 13 million school days are missed each year due to asthma, and asthma accounts for about 10.1 million missed work days for adults every year. Here are just some of the ways Israeli ingenuity is helping to prevent asthma and simplify diagnosis, monitoring and treatment. Or-Akiva-based Deep Breeze has revolutionized how asthmaand other chronic lung conditions are monitored in the hospital and at home. It records acoustic lung vibrations through external radiation-free sensors, then converts the vibrations into images and quantitative data. Deep Breeze is used at hospitals in the United States and more than a dozen other countries for non-invasively triaging, diagnosing and managing patients rapidly and accurately. The new Breeze@home works on the same principle, only it’s smaller and cheaper. 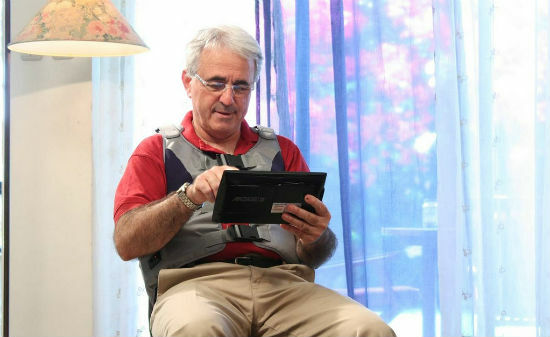 Sensors inside a custom-tailored vest collect lung-function data and transmit it via an incorporated smart phone or tablet computer to the patient’s healthcare provider. Once on the market, this advancedwireless telemedicine monitoring system will allow many people to be monitored continuously without the need for hospitalization. If a child wakes up wheezing from an asthma attack, how can parents and physicians judge if it’s mild enough to be handled at home or serious enough to warrant an emergency room visit? Quantifying the severity of asthma is easier thanks to KarmelSonix, an international medical device company with R&D, engineering, quality assurance and clinical support staff in Haifa. The company makes a portable Personal Wheezometer for spot checks at home and the physician’s office; the WHolter wheezing and cough recorder, which monitors and stores breathing data for eight to 24 hours to detect exercise-induced or nocturnal asthma; and PulmoTrack, in use at US hospitals to monitor small children, the elderly and acute asthmatics. 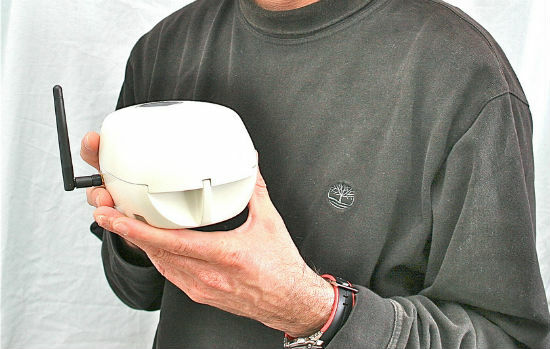 In 2006, Israel’s Teva Pharmaceuticals introduced the ProAir HFA Inhalation Aerosol — an environmentally friendly device for delivering inhaled asthma medication. The previous year, the FDA had announced a ban on inhalers containing ozone-depleting chlorofluorocarbon (CFC). Teva then partnered with the American Lung Association to help some 20 million asthma patients transition to the new inhaler. It offered a patient assistance program, complete with a toll-free helpline, to teach consumers how to obtain, use and clean the new inhalers, as well as teaching them the differences between the old and new products. Asthma can be relieved by salt therapy, a natural remedy for respiratory and sinus problems dating back to salt caves in Middle Ages Greece. Inhaling microscopic particles of sodium chloride-rich rock salt dries up and disinfects mucous membranes in the sinuses and lungs. Israeli expert Baruch Bekker opened the first Israeli salt room in Haifa in 2000, followed in 2009 by Breathewell clinics in Modi’in and at the Jerusalem BioPark at Hadassah University Medical Center. The Jerusalem sitewas the first such facility in the world with both speleotherapy and halotherapy rooms. The former is constructed with large blocks of salt that naturally emit salt particles into the air; the latter features salt-coated walls and a salt generator that crushes the salt and blows the particles into the air. Additional Breathewell clinics have since opened in Israel, and the entrepreneurs behind the initiative have been introducing the concept to theNew York area, where it’s not nearly as well known as in European and Asian countries. Israel remains one of the only countries in the world where salt therapy is covered by national health insurance plans. There is a clear connection between air quality and asthma, but monitoring air pollution has been an expensive proposition — until an Israeli company’s novel, low-cost device came along to provide real-time information on air quality anywhere. AirBase Systems co-founder Irad Kuhnreich had asthma as a child and also has two kids with the condition. A graduate of the Technion, he decided in 2009 to tackle the problem using the latest nanotechnology to fashion tiny, highly sensitive sensors. The small plug-and-play CanarIT models (one for indoors, one for outdoors) use patented algorithms to identify pollution patterns and rate the threat, wirelessly transmitting graphic reports delivered to computer or handheld device. It also suggests simple, smart ways to reduce exposure to air pollution, such as closing windows on particularly smoggy days. Three of the four founders of Ramat Gan-based EarlySense have children who suffer from asthma. They saw the need for a smart contact-free respiratory monitoring system to help parents and doctors identify deterioration in their children’s condition and prevent or minimize an attack before it happens. 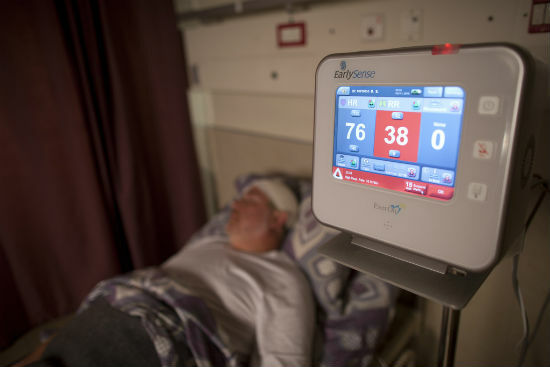 The first EarlySense system went on sale in the United States in 2008, and it appeals not only to parents but also healthcare professionals in clinics, nursing homes and hospitals. The monitor slips under the mattress and automatically measures the patient’s breathing and heart rate. In 2007, Hebrew University pharmacology PhD candidate Ido Bachelet – now a senior lecturer at Bar-Ilan University – worked with research colleague Ariel Munitz to designed a small antibody fragment that can target the cause of asthma and allergies rather than merely the symptoms as current medications do. Still under development with the expectation of proceeding to clinical trials, the antibody works on the receptor protein on the surface of mast cells, the cells responsible for asthmatic and allergic reactions such as stuffy nose and airway constriction. In animal studies, this antibody eliminated four different types of allergic diseases. In addition, when severely asthmatic mice received the antibody in nose drops, their health was restored in less than two months. According to a 2004 Technion study, a key to preventing asthma might be found in a lemon. Inhaling limonene, the main component found in the essential oil of citrus, prevented asthma symptoms in animals that inhaled it. The findings were published in the journal Bioorganic and Medicinal Chemistry. Lead researcher Prof. Ehud Keinan studied the connection between ozone and asthma and other lung disorders, concluding that the higher incidence of asthma in urban areas has to do with the absence of natural “ozone scavengers” produced by plants. Ozone can cause inflammation of the lung’s membranes, and limonene is a particularly effective ozone scavenger. In rats with induced asthma-like symptoms, limonene inhalation prevented asthmatic symptoms and worked as an anti-inflammatory. Ozone on lung membranes is a bad thing. But ozone in water is a good thing because no pathogen can survive it. That’s the concept behind Greeneng Solutions, an Israeli company that manufactures ozone-based cleaning systems to purify water in restaurants, hotels and hospitals without chlorine or ammonia. What does that have to do with asthma? Studies have shown that swimming in chlorinated pools may trigger asthma and other respiratory problems from chlorimines, harmful chemicals formed by chlorine coming in contact with organic substances. Greeneng’s upcoming Ozopool product would largely replace chlorine as a swimming pool disinfectant. It’s expected to be approved shortly by the Israeli Ministry of Health. Everyone knows that “second-hand” smoke breathed by people in the same area as smokers is a serious health hazard. Scientists from Haifa’s Technion-Israel Institute of Technology discovered that even “third-hand” smoke – the invisible remnants of cigarette smoke on household surfaces — increases the risk of asthma and other respiratory problems in non-smokers. Dr. Yael Dubowski and her colleagues reported in the journal Environmental Science & Technology that nicotine interacts with the ozone in indoor air to form potentially toxic pollutants on furniture, carpeting and food. The scientists said that the risk for babies crawling on carpets, and for people napping on tainted sofas, is especially concerning.